This is a really nice, large, custom-made aquarium. The tank itself is constructed of high-grade acrylic and the cabinet is constructed of solid oak and oak veneer plywood and finished with a black stain. It was enjoyed for over five years but now must make way for a major re-model and a eventually a new and larger tank. It measures 36" X 36" X 24" high, and holds 140 gallons. 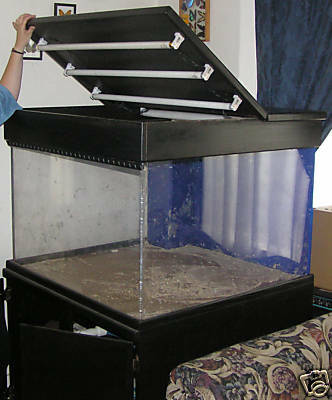 It has an overflow system with a 5-gallon sump tank and bio-ball filtration system. It comes with enough substrate to cover the entire bottom to a depth of about 2-1/2 inches and lots of large corral. 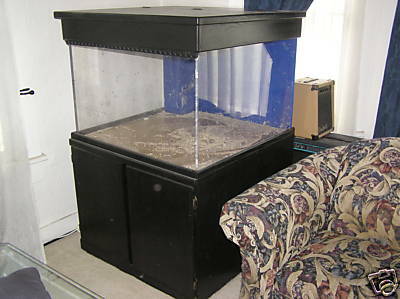 In addition, it comes with two quarantine tanks, one 20 gallon and one 5 gallon, and all their accessories. 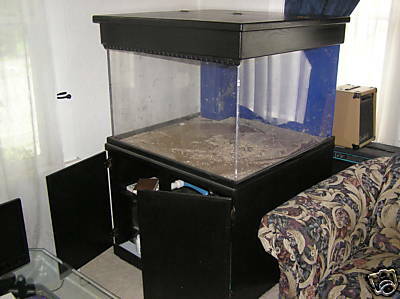 This tank would be ideal for cichlids. If you have any questions please feel free to e-mail them however I'm selling this for someone else so it may take a day or two to get your answer. I only accept payment by PAYPAL or cash if you pick it up. It can be picked up in Seattle, WA or I will deliver within 200 miles of Seattle, WA for $.60 per mile (one way) otherwise all shipping and packing arrangements and costs are the buyer's responsibility.